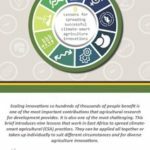 The process of getting better practices to more people – “scaling up” innovations to make agriculture more climate-smart – has baffled many development practitioners. Some approaches work on a small scale, but suddenly on a larger scale, everything changes. These are the challenges that the authors of these 9 briefs just published set out to address. The briefs document successful lessons which apply even on a wider scale, to scale-up successful agricultural practices to tackle climate change across Africa. Lesson 1 outlines what’s needed to create equitable, climate-smart agricultural policies. 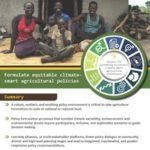 Robust, resilient, and enabling policy environments are critical to take successful climate-smart agricultural technologies and interventions to scale at national, regional, or local levels. The best policies to address climate variability, take socioeconomic, environmental and gender-related factors into account. 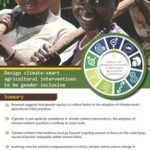 If interventions are not gender-responsive, they are unlikely to reach scale, so lesson 2 outlines what’s needed to make sure proposed climate-smart practices indeed are gender-smart. Is gender considered at each stage of a project cycle to take gendered perspectives into account? Lesson 3 focuses on the bigger picture. Tackling climate change needs to happen on different fronts: mitigating the impacts and adapting to climate change, with increase in productivity. But gains in all three areas are unlikely, so how do you decide what needs to give way for maximum benefits? Having the climate-smart intervention is one part of the challenge. But then, a number of steps have to be taken for diffusion and before they can become accepted in the community. In lesson 4 we see how, for example, farmer-to-farmer learning can be up to six times more effective in influencing the adoption of CSA practices, in the right context. Lesson 5 takes data collected from more than 5,000 households in 15 countries across three continents, to understanding the conditions upon which specific interventions are likely to thrive where others might fail. Some factors, like access to weather information, may always have a positive outcome, but others can depend on cultural context. The way in which successful practices are scaled up, is just as important as the practices themselves. Lesson 6 looks at the challenges of drilling down into specific examples to scale successes up, taking biophysical, socioeconomic, and institutional elements into account. Limited investment in climate-smart technology and adoption means that priorities need to be set. But how to rank the performance of some technologies over others, especially taking context and many differences in location into account? This is tacked in Lesson 7. Lesson 8 tackles the issue from a bird’s eye perspective, showing the impact of climate change on the soil and whole landscape. Since better soil health can increase agricultural productivity, frameworks are needed to assess multiple indicators for effective land rehabilitation and, to guide investments. Finally, Lesson 9 points out that, once interventions are in full swing, they need to monitored, and they may need tweaking to ensure they remain relevant. This real-time, cost-effective monitoring tool, allows fast feedback from the field, so managers can stay on top of developments. Re-blogged from the CIAT Blog written by Georgina Smith on 17/11/2017. Read the original article here.